Harman Kardon offers its HKTS9 5.1-Ch. 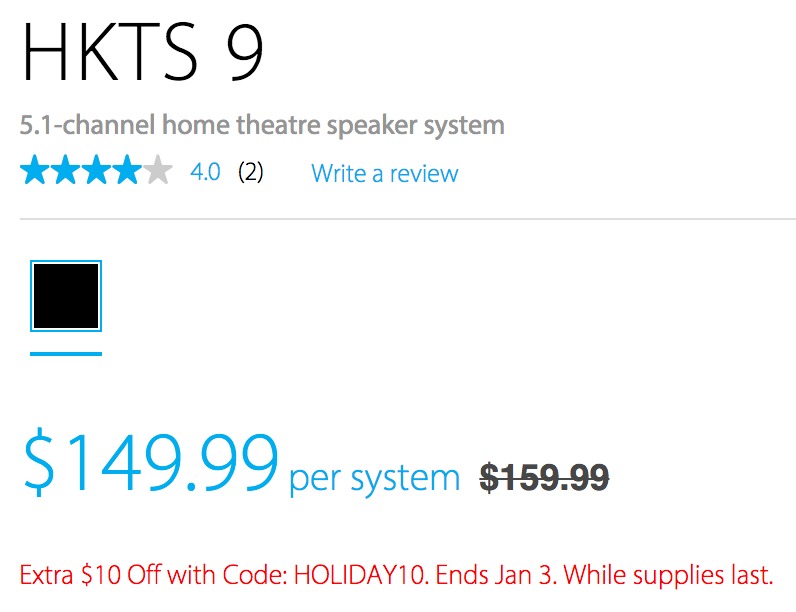 Speaker System for $149.99 shipped when promo code HOLIDAY10 is applied during checkout. For comparison, that’s $450 off the original MSRP, down $10 from our previous mention and the best that we’ve seen. While reviews are somewhat slim on this model, most Harman Kardon speaker systems have received solid ratings at Amazon. If you’re going to add surround sound to your home playback system, you will want to do it once – and do it right. That’s why the HKTS 9 home theater loudspeaker includes five voice-matched satellite loudspeakers for the center, left/right front and left/right surround channels, in addition to an attention-grabbing, 200-watt powered subwoofer. The speakers are magnetically shielded to prevent interference that can damage your television. Together, the combination creates an immersive, 360-degree surround-sound environment. We’ve engineered all of the system components to work together, resulting in a rich, realistic, all-encompassing sonic performance with convincing sound effects. If you want to adjust the sound, we’ve equipped the subwoofer with phase and bass-boost controls.